Psychiatry PRN contains core content for psychiatry education, but gives prominence to clinical and practical skills, as well as exam preparation. PRN is a Latin medical acronym meaning Pro Re Nata (as required). These letters also inform the structure of the book into the parts: Principles, Reality and Next Steps. 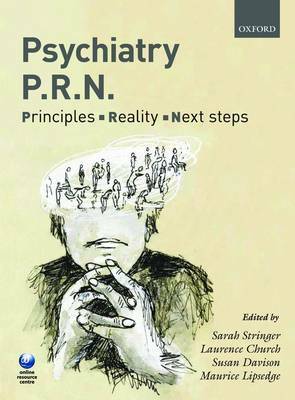 Each of the main chapters opens with Principles, which cover the key characteristics of a psychiatric condition. This is the typical ground of textbooks, and this book covers all the necessary ground as concerns undergraduate learning outcomes, but is arguably more succinct than standard works on the subject. Nevertheless, illustrations and the careful use of pedagogic features (prominence given to key facts, tips and points of reflection, as well as effective use of tables) lift even this most standard area of coverage. The Reality section is where this book begins to really distinguish itself, with a practical articulation of clinical skills for the novice. This involves sample dialogue which might form part of the psychiatric interview, which bravely, yet skilfully reflects the reality with which patients present, and the difficulties often encountered by medical students. The content in this section includes a general approach (Tips, Tricks and Cautionary Tales), leading to a sample interview, moving on to indicative stations for Objective Structured Clinical Examinations (OSCEs). The Next Steps section puts psychiatry into the context of early working life as a doctor, and highlights where psychiatric considerations overlap with medical and surgical management, as exemplified by scenarios dealing with capacity to consent to treatment. Psychiatry PRN exists to enable students to engage with psychiatry. In addition to the framework described above, the book is rich in illustrative content, be that an original impressionistic picture of a condition, or an allusion to contemporary cultural representations of mental health and illness, to which students may relate, albeit if they haven't previously encountered psychiatric disease. To catalyse this process, the book opens with Vincent Van Gogh as its first patient, and continues in a vivid, humane fashion to prepare the student for the typical content of undergraduate psychiatry, with particular flair in terms of practical interactions with patients and associated assessment. Online Resource Centre: www.oxfordtextbooks.co.uk/orc/stringer * Video clips of key psychiatric interviews e.g. mini mental state examination, history taking of depression. Clips accompanied by guidance on usage. * Illustrative content from the book, including clinical signs drawings (with exercise), visual mnemonics of side effects and risk factors, and impressionistic drawings of psychiatric conditions. * Self-assessment resources, including sample OSCEs and interactive cases.